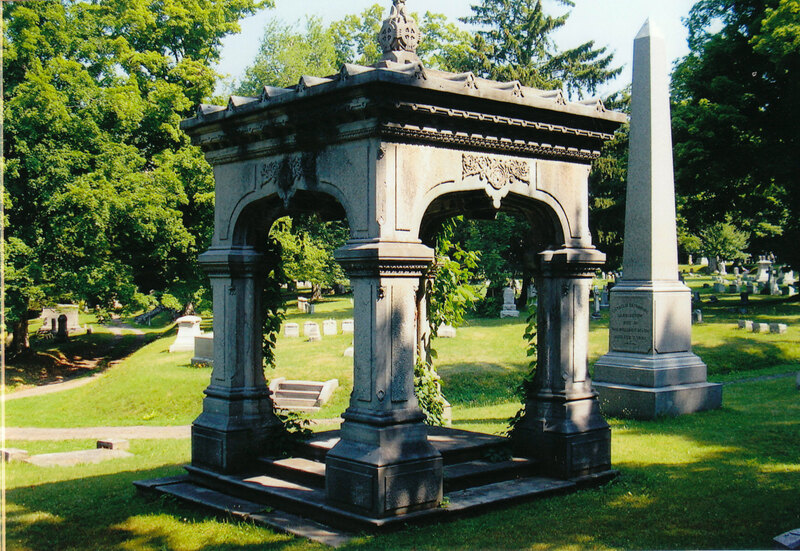 Burton Arnold Thomas (1809-1880) of Sand Bank, Renssalaer County, NY, designed the Riverside Cemetery of Oswego in 1855 in the ’garden style”, a romantic kind of landscape which had become popular in the first half of the nineteenth century. The park-like setting contrasted sharply to earlier Oswego cemeteries, the first lying west of Fort Oswego in the 1797 plan of Oswego Village, then later cemeteries located where Kingsford Park and Fitzhugh Park Schools are located today. 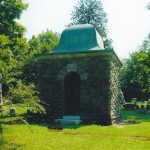 The Kingsford Cemetery, opened in 1828, received bodies from the old lake shore cemetery and gradually filled as the mid-century mark approached. The Fitzhugh site, opened in 1830, also filled at about the same time. As these cemeteries, surrounded by residential areas, became full, citizens decided to establish a new cemetery farther away from the dense population areas; a cemetery that would reflect a new philosophy in cemetery design. 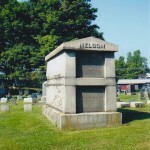 Accordingly, the following men organized the Oswego Rural Cemetery Association (Riverside Cemetery) on July 13, 1855: John C. Churchill, John B. Edwards, Abraham P. Grant, Gilbert Mollison, Frederick T. Carrington, Thomas Kingsford, Samuel B. Johnson, Simeon Bates and William F. Allen. 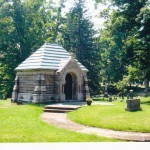 The founders of the cemetery included some of the community’s best educated, wealthiest and most influential people. The association purchased the 140-acre Thomas Robinson farm located about a half mile south of the city line on County Route 57 for $5,699. 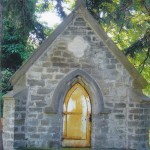 The rural cemetery movement in the United States began with the creation of Mt. 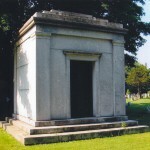 Auburn Cemetery in Cambridge, Massachusetts (1831), followed by Laural Hill Cemetery in Philadelphia (1836), and GreenWood Cemetery in Brooklyn in 1838. In the 1840s Howard Daniels designed Spring Grove in Cincinnati (1845) which launched Daniel’s career. 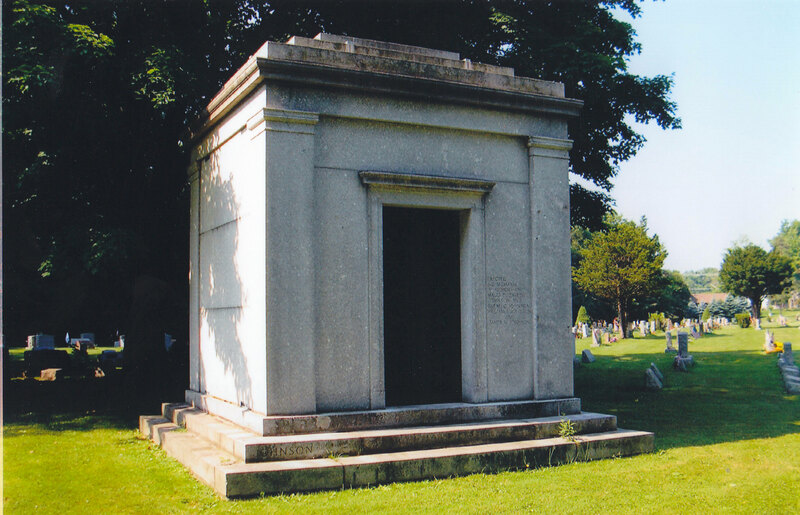 Burton A. Thomas laid out Riverside Cemetery in Oswego in 1855 and Vale Cemetery in Schenectady, NY, in 1857, the same year that Daniels designed Oakwood Cemetery in Syracuse, NY. As attitudes about death changed from a viewpoint of fearing eternal punishment to one of death meaning reunion with loved ones and with God, the corpse was no longer buried and forgotten, but now was viewed as an object of sentimental veneration. The overcrowded, neglected and unsanitary cemeteries of the crowded cities moved to the country. In Mt. Auburn the conventional grid-patterned cemetery disappeared and in its place appeared the “country-style cemetery” with wooded areas, ponds, landscaped roads and footpaths. 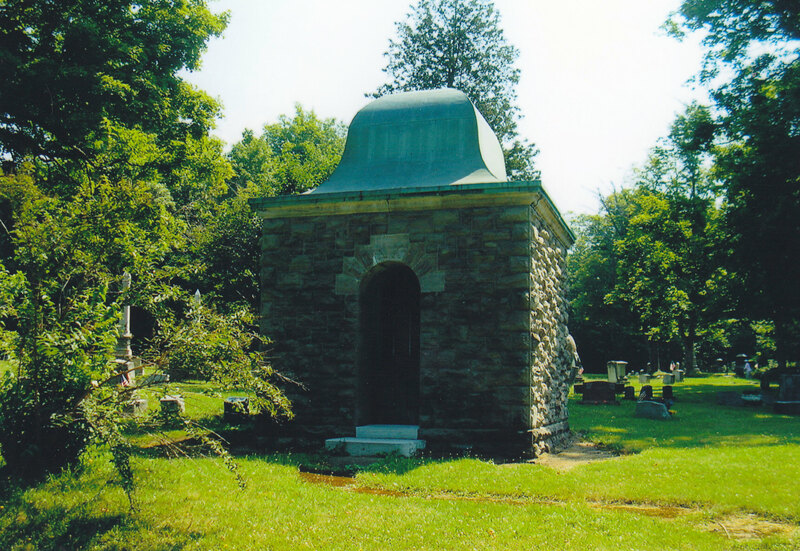 Thomas designed Riverside Cemetery in a like manner; romantic pastoralism emphasized hills, groves of trees, winding paths and bridges, and views and vistas. It was a short step from beautifully designed rural cemeteries to the design of public parks. Just as Frederick Law Olmsted designed New York City’s Central Park, other landscape architects moved from designing cemeteries to the design of serene park lands. 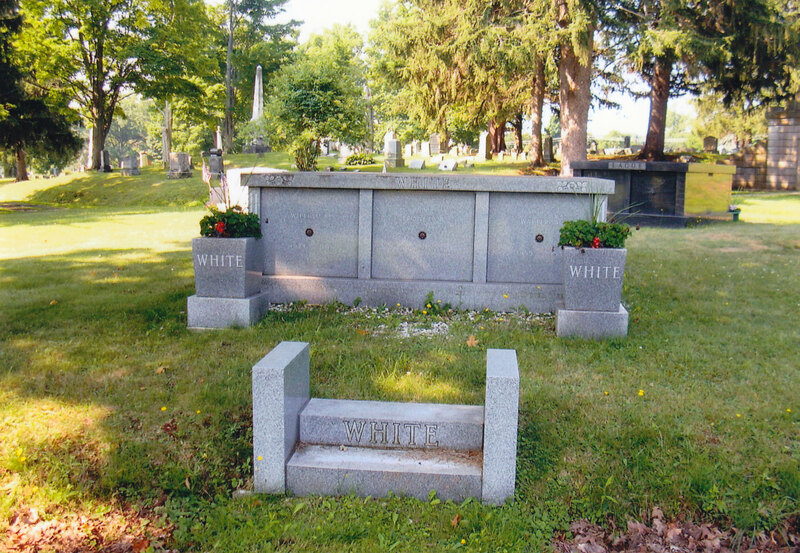 At the same time, the wealthy cemetery patrons began to commission the same architects who designed their homes to design suitable monuments for their cemeteries. At Riverside can be found mausoleums and ornate vaults in Greek, Gothic and Egyptian architectural styles. 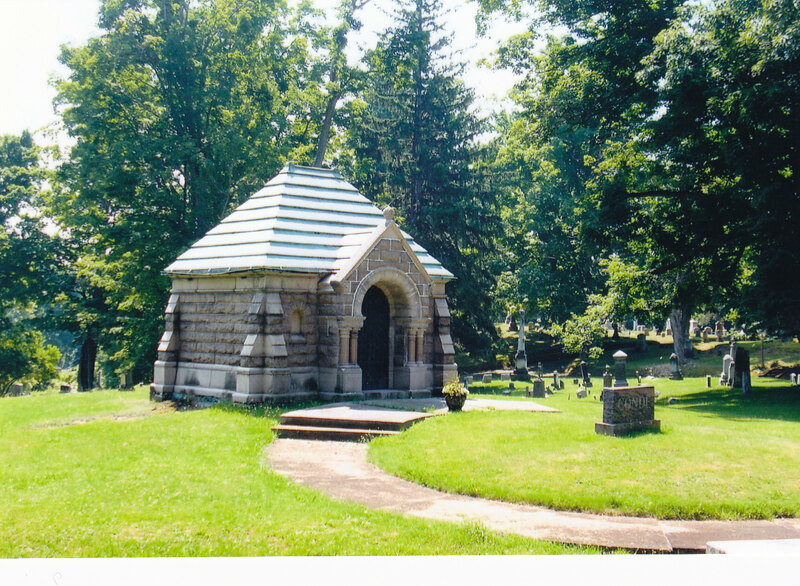 Examples include the Ludlow mausoleum, Gothic style with a steep slate roof and buttresses on each corner; the Carrington pavilion, a Tudor Gothic structure; the Simpson monument consisting of a cross-gable roof supported by four corner Corinthian columns (designed and built by Anthony Salladin, an Oswego County sculptor and monument maker); the Conde mausoleum in the Romanesque style; and the Nelson vault, Egyptian in style. 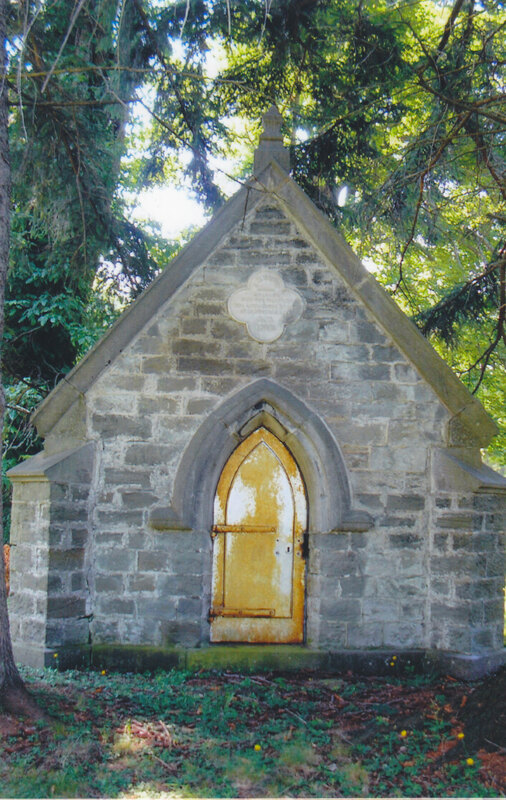 The family of Alanson S. and Elsie Page of Oswego contributed the money to build the 1906 Page Memorial Chapel, a small Gothic Revival stone church with a tower. Designed by Fielding Mantle (1865-1941) of Philadelphia, the chapel was built of northern New York State granite, gneiss offset blocks in the buttresses and arches, and a slate roof. The interior chapel walls feature a paneled oak wainscot below and stone above. The interior trim and pews are all of oak, including the choir pews which have carved finials. The elaborate stained-glass windows in the sanctuary were designed by Frederick Wilson and manufactured by Tiffany Studios of New York City. In the rear, the receiving vault (1875) was built into the hillside and later attached to the chapel basement via an underground tunnel. Alanson S. Page, for whom the chapel was named, operated a lumber mill in Minetto and, in 1870, with Cadwell B. Benson founded the Minetto Shade Cloth Company. He was mayor of Oswego in 1870 when the Oswego City Hall was built. His numerous contributions to his community reflected his various interests in the development of Oswego. The public is invited to view its ponds, landscaped roads and footpaths, funerary art, vistas and historic buildings. 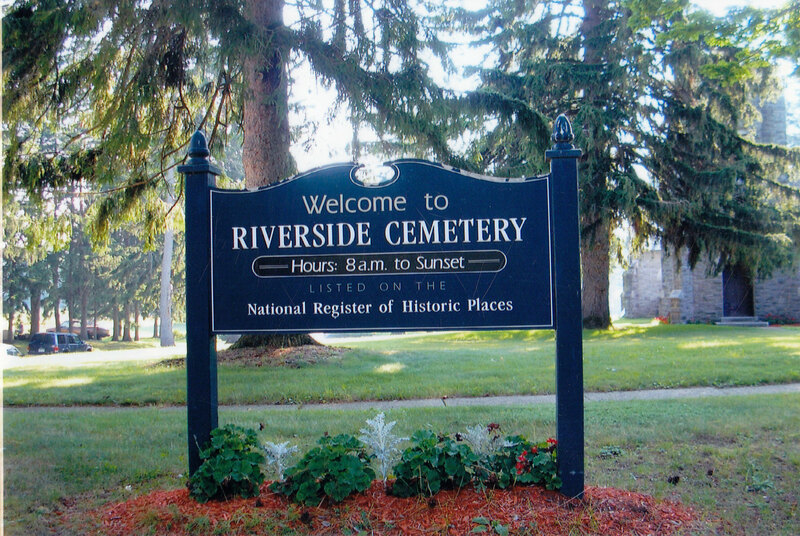 For more information visit the cemetery’s web site (www.riversidecemeteryofoswego.com) or phone 315-343-7691 to request driving tour brochures. A noted authority on Oswego’s history, Dr. Breitbeck has served as Director of Education for the Oswego County Historical Society for six years and as Research Associate for the Heritage Foundation of Oswego for 16 years. In that position she wrote nominations for many historic districts, buildings and sites including Riverside Cemetery. The fruits of her labor can be seen throughout the City and County of Oswego where markers from the National Register of Historic Places are prominently displayed. Dr. Breitbeck currently serves on the Oswego Historian Advisory Board. 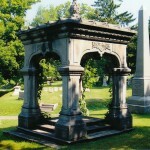 An interesting feature of Riverside Cemetery can be found in its Fall 2010 Newsletter. Early on the local Jewish community had purchased a plot of land from Riverside so they could have a proper burial ground for their deceased. The land was fenced off and consecrated, “the only such consecrated ground in Oswego County for its fellow Jews’.” Several Safe Haven refugees who passed away before the end of World War II were buried there. 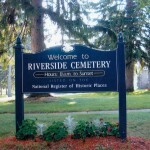 This entry was posted in Feature, New York, Oswego, Riverside Cemetery. Bookmark the permalink. I’m looking for Anthony Woods dit DuBois. Married to Virginia DuC*****. Sons: Anthony b 1855 Liverpool, New York; George b 1857 Oswego. believe Anthony Sr died between 1856 to 1868. His wife was found 1870 in Bay City, Michigan married to Frank Phoenix with a son by Frank named Frank age 1m along with the 2 sons by Anthony. My question did Anthony Sr join the Civil War as a Union solider and die during the War. I couldn’t find any where, where he signed up or died. Right now it’s just a theory. Or did he die working on a ship or at another trade. Looking for Melora Smith Barnes and ancestry. Our family has 2 pictures of her. 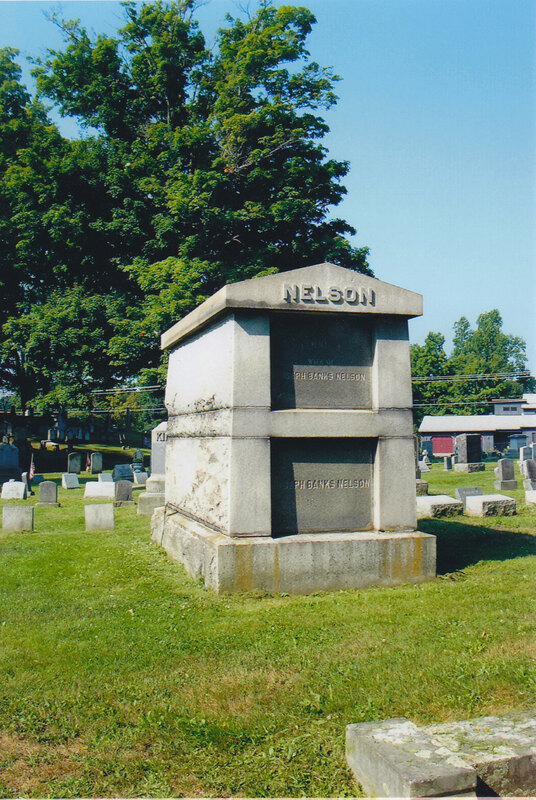 I also have seen a picture of her marker in Riverside Cemetery and looked into and found 3 other Riverside Cemeteries in Oswego county. From the pictures I saw, I believe the plot is in the town of Oswego due to all the tall memorials and park like setting. She was born in the late 1800’s and died around 1908. 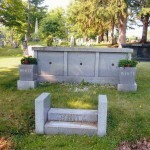 Her husband was State Senator Ezra Andrew Barnes who died in 1928 and should be buried in the Barnes plot together. Any pictures of markers, family photos with identifying members so appreciated. Willing to share what Barnes history I have, I have traced the Barnes line to England and offshoots of Betsey Glover Peabody Barnes to Massachusetts.. I have been searching for my great grandmothers cemetery plot for years I know she was buried in riverside cemetery in 1970. She does have a headstone, her name is Jennie Harding she passed on May 8, 1970. She was a widow to Charles J. Harding, and the funeral was handled by Dain Funeral home. If there is anyway you can help me find her it would be greatly appreciated.